A car with a wonderful paint job looks much better and special. Professional vehicle paint is capable of delivering the kind of best results you need. No matter what kind of a budget the paint job has, there are a lot of paint products for a car that can transform the exterior of the car with a durable finish and ensures the work go much faster. If you have checked, you will realize quality paints are provided will all sorts of prices. The best vehicle paint you will have to use depends on the amount to be spent and the application itself. Economy car paint is designed to be affordable paint, but pro car painters have realized a number of brands are much better in the way they hold up, as much as the jobs are inexpensive. However, the fact that a certain brand of paint is cheap and affordable hardly means the job will not be satisfactory. 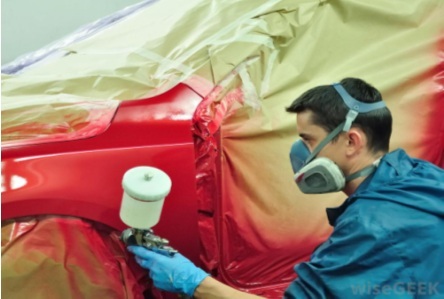 In most cases economy auto paints provide a decent finish, gloss or coat that can last for a number of years. Lots of paint centers provide economy auto paint services where lots of inexpensive paints are also used. Nonetheless, as you search for an affordable paint, it is a better idea to avoid car paints made in China as much as possible. Experience has shown that they have a problem with holding up and could peel or chip after 12 or so months. Rather, the best idea is to seek affordable paint services using cheap brands you know yourself. No matter what you intend to spend in economy paints, anything not exceeding $80 on the high side is a better choice. If you are looking for a higher quality job on your car, perhaps better auto paint can get you the quality you are looking for. A standard auto repainting or paint job can be anything between two thousand and five thousand dollars. However, it depends on the individual doing the repainting, including the quality and grade of the auto paint in use. Kuston Shop, PPG, Duramix and Diamond are some of the companies known for their high-end paints used by professional painting shops across the United States. High quality paints are excellent and successfully used in so many types of applications with a number of spray guns for automotive painting also used. Cheap auto paints are purchased in gallons, but higher quality ones are mostly sold in quart or pint sizes. Every quart could cost you between $30 and $100. There comes a time when unique or outrageous paint jobs are everything for your vehicle and getting paints used specifically for advanced applications or custom jobs is a great idea. A number of companies offer paints ideal for custom jobs designed to meet the needs of special paint jobs. In fact, some auto paint brands allow professional painters to be as creative as possible with specialty paint jobs, especially for those desiring a quality showroom kind of auto paint finish. A quart of such paint could fall between $500 and $600. This article is written by James after he got inspired by looking at this website which offers awesome custom paint jobs for your car.